The most common type of funeral service, a viewing is held which is then followed by a funeral or religious service. The viewing may be either several hours prior to the service, or held the night before the service at our facility. After the funeral service is complete, either at our funeral home or at your place of worship, a procession is held to the cemetery where a committal service takes place. 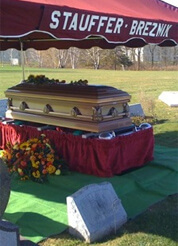 We offer a wide variety of caskets to accommodate every need, available in either wood or metals. Our exclusive csket supplier is Omega Casket Company, and their online catalogue can be accessed by clicking the Caskets tab above. Contrary to popular belief, it is the cemetery regulations and not state regulations which require the use of a burial vault. Not only does the burial vault prevent grave sinkage, but a properly sealed unit will provide the ultimate in protection from earth elements and water seepage to its contents. Concrete vaults, some with additional liners of plastic and precious metals, are the industries leading choice. Burial Vaults offered through our funeral home are exclusively supplied by the Fegley Vault Company of McAdoo, PA. Their expertise and attention to detail in both their product manufacturing process along with the delivery, setup and installation of the product are unmatched in our local area, making them the preferred vault company of the Stauffer-Breznik Funeral Home. You can access their online catalogue by clicking on the Burial Vaults tab above.